Icon of Arch. Michael the "Mantamados"
Procession at the church of Mandamados on Lesvos, Greece, during the religious festival dedicated to the Taxiarchis Michael. 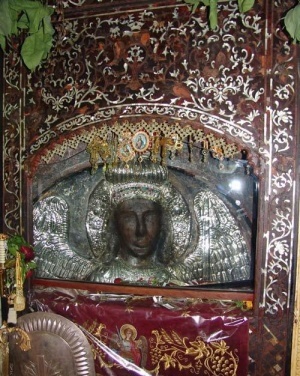 Archangel Michael of Mantamados (Gr. O Μανταμάδος) refers to a miraculous icon of the Archangel Michael on the island of Lesvos and is one of the four miraculous icons of the Archangel in the Dodecanese of Greece. 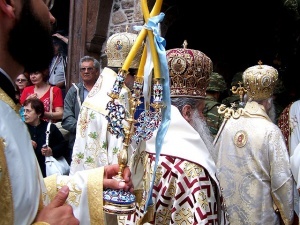 The monastery is known locally as Taxiarches (the "Archangel") and the feast of the icon is celebrated on November 8 (the Synaxis of the Bodiless Powers) and September 6 (the Miracle at Colossae). This icon, is now kept within the interior of the church. Many islanders claim to have had personal experiences of miracles being granted for them by Mantamados. This is evident by the numerous cabinets full of tagmata (gifts) to the Archangel housed inside the church. To this day, pilgrims to this church have mixed emotions regarding this icon. At times, the expression on the icon can appear severe, sad, or happy, according to the message that the Archangel wants to convey to that pilgrim or the faithful. This is the tradition of the much-celebrated icon of Mantamados. On the island of Lesvos, one can visit this miraculous icon at the Byzantine Monastery of the Taxiarchis (Archangel) Michael in the district of Mantamados. 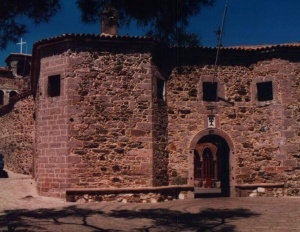 This monastery is situated in the northeast part of Lesvos, 36 km from Mytilini. The history of this monastery and the icon are closely connected to the history of the island of Lesvos. This is a famous monastery, made of stone. The monastery was most probably abandoned in 1462 the year of the island’s occupation by the Ottoman Turks. In the past, the monastery functioned as a men’s convent and is first mentioned in a 1661 ecclesiastical document. The small church within the monastery originally dates from the 17th century but was replaced by larger church in the 18th century. The present church (cathedral) was constructed in 1879 and follows a three-aisled basilica architectural type. The monastery is structured para-metrically around this church. ↑ According to which story you are told, the novice is supposed to have either been working in the fields nearby or hidden behind a rock. ↑ According to some accounts they were drowned. Hail, Michael, great chief commander with all the hosts of heaven! Amateur footage of monastery entrance, September 2008. This page was last edited on February 11, 2013, at 21:31. This page has been accessed 82,061 times.